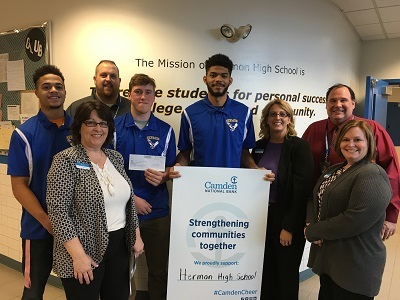 With Camden National Bank’s donation, free tickets and transportation were available for hundreds of Maine high schoolers who traveled to the Championship games in Portland, Bangor, and Augusta. Camden National Corporation (NASDAQ:CAC), founded in 1875 and headquartered in Camden, Maine, is the largest bank holding company in Northern New England with $4.1 billion in assets and nearly 650 employees. Camden National Bank, its subsidiary, is a full-service community bank that offers an array of consumer and business financial products and services, accompanied by the latest in digital banking technology to empower customers to bank the way they want. The Bank provides personalized service through a network of 60 banking centers, 76 ATMs, and lending offices in New Hampshire and Massachusetts, all complemented by 24/7 live phone support. 2017 marks the 8th time Camden National Bank has received the “Lender at Work for Maine” Award from the Finance Authority of Maine. Comprehensive wealth management, investment and financial planning services are delivered by Camden National Wealth Management. To learn more, visit CamdenNational.com . Member FDIC.